“Let me inherit a double portion of your spirit,” Elisha replied. While studying the stories about Elijah and Elisha in 1 and 2 Kings and reading some rabbinic commentaries on their lives, I came across an interesting thought concerning these two great prophets. We know from the next verses that Elisha did see Elijah as he was taken up to heaven and that God authenticated Elisha’s succession to Elijah’s ministry by giving him the same divine powers that had accompanied Elijah’s ministry. But, did Elisha receive a double portion of his spirit? There are seven miracles attributed to Elijah in 1 and 2 Kings (some scholars count more because they count prophecy as a miracle). When Elisha comes to the end of his life in 2 Kings 13:20, he has had thirteen miracles recorded in scripture (again, more can be counted). The fourteenth miracle of Elisha occurs in a bizarre story after his death, when a dead body touches Elisha’s bones and and the dead body is brought back to life (2 Kings 13:21-22). Elisha did receive a double portion of the spirit of Elijah! Was this a coincidence or did the Hebrew writers pen it that way so that the digging student of the text would pick up the connection? It ‘s a fascinating thought and would be just like God and the Eastern mindset to deposit that nugget in scripture. Note: If you Google “Miracles of Elijah and Elisha”, you will find the miracles of each man that are recorded in scripture. Depending on what you consider a miracle (prophecy, etc. ), you can get up to 16 miracles for Elijah and 32 for Elisha. I read another commentary that had 8 for Elijah and 16 for Elisha, but 7 and 14 was the most common figure. 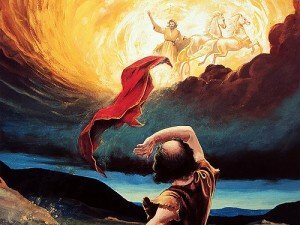 The fact that Elisha’s miracles exactly double Elijah is just a neat way of saying through the text that God gave Elisha a double portion of His spirit. « Two Sons of God?